This is not a watch or clock design exactly, just a clock face design that can be applied to a clock or watch. 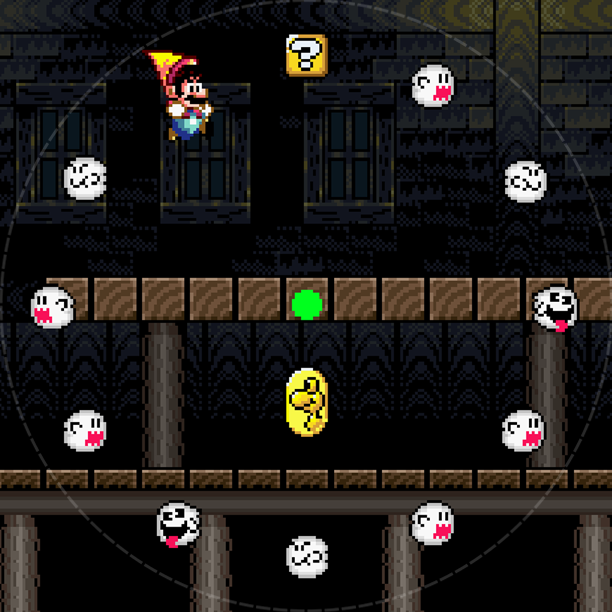 And this face design uses the ten Boos that flew in a circular pattern in a Ghost Castle level in Super Mario World (SNES). Filling in the void is a question block and Mario himself. I want to say that this is an exact screen grab from the game, but I had to finesse the Boos slightly to fit the clock numbers layout. Also I had to raise the question block a bit and push the Yoshi coin to the left. Other than that it’s true to the game. I was going to make this into a clock for myself (even bought a small wall clock from IKEA), but my printer – which I hate and is the reason I don’t do more papercraft posts – is on the fritz. However I will share the template with you! Should be fun for a rainy day project. It is 8.5″ x 8.5″ in size, though you might have to re-size depending on the diameter of your clock and/or your printer’s abilities. I marked the center with a green dot, which you’ll need to punch out for the clock hands. Another way to go is to make this whole design smaller, making it sit inside the existing numbers of your clock. Personally I like this design because all the Boos have varying expressions, which gives the clock a lot of personality. If anyone manages to make this please send me a pic! I’ll post it here. For the rest of the Watch This! series, please click here. You could make this idea even geekier. When I was a kid I had a golf themed watch** that had a golf ball that went around the clock. It was on a plastic thing inside and acted as the second hand. If you put another boo in there, It would be cool for Mario to float around to act as a second hand. Or if a mushroom would pop out of that ? block, have that as the second hand. You wouldn’t be able to make a version of the clock like this unless you bought your own clock mechanism and played around with finding a workable plastic to paint/stick the sprite to, but it’s a fun idea. This is awesome, and I decided to take a crack at making a version for the Pebble smartwatch. Had to make the ghosts bigger and redraw them in black and white (due to screen size and lack of grayscale), and I removed the background to prevent it from being too hard to read. I think it came out pretty well, and the one with the white background looks better than black. Very cool! I think the minimalist approach works great. Thanks for making it and sharing here. Ever thought about doing a blog on Tumblr?